The High Powered Firearm LED Light & Laser combines a brilliant white light with a bright red aiming laser. 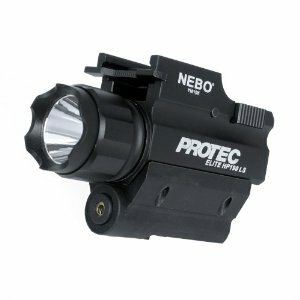 It uses a highly efficient, recoil-proof LED to generate 190 lumens of blinding white light with a 5-milliwatt, 650 nanometer laser sight, located below the light. Light of this magnitude is enough to dominate an aggressor’s night adapted vision, ideal for military, law enforcement, and self-defense. The reflector lens focuses the beam for long distance lighting while also producing enough light to support the user’s peripheral vision. The HP190LS’ batteries will produce 3 hours of continuous illumination. The compact body of the HP190LS is constructed of aircraft grade anodized aluminum making it a lightweight, yet powerful light source. The High Powered Firearm LED Light & Laser is also O-ring and gasket sealed to be completely weatherproof. The On-Off switch provides convenient one-finger operation. This switch allows you to select between 100% white light or defensive strobe. A separate switch on the bottom is used to control the laser. The laser sight is adjusted by two screws (see diagram) that are designed to not loosen. A small screwdriver is included to adjust the elevation and windage of the laser. Laser travels over 450 yards.